Source: Shiller (2013), DShort.com (2013), Chris Turner (2013), World Exchange Forum (2013), Federal Reserve (2013), Butler|Philbrick|Gordillo & Associates (2013). Matrix 1. contains a few important observations. Notably, over periods of 10-20 years, the Q ratio, very long-term smoothed PE ratios, and market capitalization / GNP ratios are equally explanatory, with R-Squared ratios around 55%. The best estimate (perhaps tautologically given the derivation) is derived from the price residuals, which simply quantify how extended prices are above or below their long-term trend.The worst estimates are those derived from trailing 12-month PE ratios (PE1 in Matrix 1 above). Many analysts quote ‘Trailing 12-Months’ or TTM PE ratios for the market as a tool to assess whether markets are cheap or expensive. If you hear an analyst quoting the market’s PE ratio, odds are they are referring to this TTM number. Our analysis slightly modifies this measure by averaging the PE over the prior 12 months rather than using trailing cumulative earnings through the current month, but this change does not substantially alter the results.As it turns out, TTM (or PE1) Price/Earnings ratios offer the least information about subsequent returns relative to all of the other metrics in our sample. As a result, investors should be extremely skeptical of conclusions about market return prospects presented by analysts who justify their forecasts based on trailing 12-month ratios. Our analysis provides compelling evidence that future returns will be lower when starting valuations are high, and that returns will be higher in periods where starting valuations are low. You can see from the table that, according to a model that incorporates valuation estimates from 4 distinct domains, and which explains over 80% of historical returns since 1871, stocks are likely to deliver 1% or less in real total returns over the next 5 to 20 years. Yikes. [T]he physics of investing in expensive markets is that, at some point in the future, perhaps years from now, the market has a very high probability of trading back below current prices; perhaps far below. 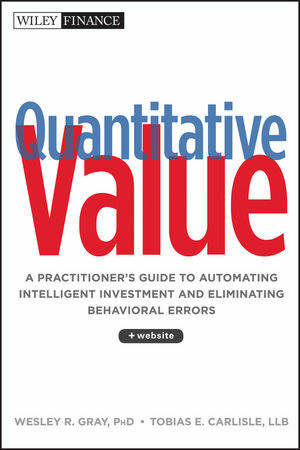 The post is a well-researched, and comprehensive analysis of several long-term market-level valuation measures. It is a worthy contribution to the research in this area. Read Valuation Based Equity Market Forecasts – Q1 2013 Update. Smithers & Co. tracks the equity q ratio for the US. The chart below shows each to its own average on a log scale. As at 12th March, 2013 with the S&P 500 at 1552 the overvaluation by the relevant measures was 57% for non-financials and 65% for quoted shares. Although the overvaluation of the stock market is well short of the extremes reached at the year ends of 1929 and 1999, it has reached the other previous peaks of 1906, 1936 and 1968. 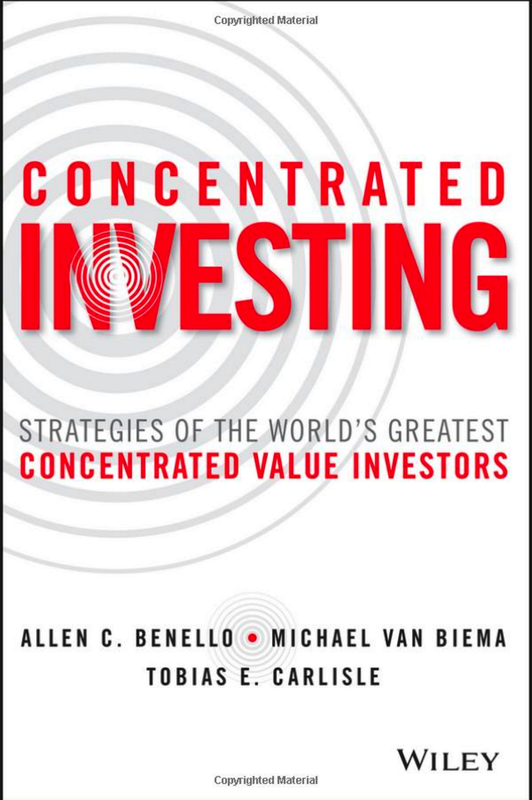 Understanding value is vital for investors. (i) It provides a sound way of assessing the probable returns over the medium-term. (ii) It provides information about the current risks of stock market investment. (iii) It enables investors to avoid nonsense claims about value. In the summer of 1997, Taleb predicted that hedge funds like Long Term Capital Management were headed for trouble, because they did not understand this notion of fat tails. Just a year later, L.T.C.M. sold an extraordinary number of options, because its computer models told it that the markets ought to be calming down. And what happened? The Russian government defaulted on its bonds; the markets went crazy; and in a matter of weeks L.T.C.M. was finished. Spitznagel, Taleb’s head trader, says that he recently heard one of the former top executives of L.T.C.M. give a lecture in which he defended the gamble that the fund had made. “What he said was, Look, when I drive home every night in the fall I see all these leaves scattered around the base of the trees,?” Spitznagel recounts. “There is a statistical distribution that governs the way they fall, and I can be pretty accurate in figuring out what that distribution is going to be. But one day I came home and the leaves were in little piles. Does that falsify my theory that there are statistical rules governing how leaves fall? No. It was a man-made event.” In other words, the Russians, by defaulting on their bonds, did something that they were not supposed to do, a once-in-a-lifetime, rule-breaking event. But this, to Taleb, is just the point: in the markets, unlike in the physical universe, the rules of the game can be changed. Central banks can decide to default on government-backed securities. US equity markets are very overvalued on a variety of measures. If Spitznagel’s thesis is correct that the frequency and magnitude of tail events increases with overvaluation, investors need to exercise caution given the extreme level of the equity q ratio. If the eventual event precipitating a sell off is a black swan, but we can expect black swans because of the market’s overvaluation, is it still a black swan? Earlier this week I posted about the current controversy around the cyclically-adjusted earnings in the Shiller PE, most notably the contention that the real earnings used in the Shiller PE are lower than they would otherwise be because of two serious earnings recessions. 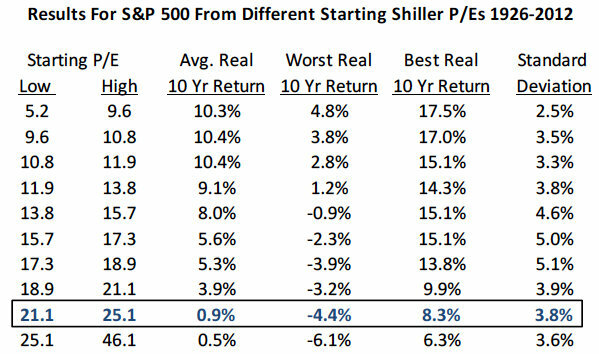 Ten-year forward average returns fall nearly monotonically as starting Shiller P/E’s increase. Also, as starting Shiller P/E’s go up, worst cases get worse and best cases get weaker (best cases remain OK from any decile, so there is generally hope even if it should not triumph over experience!). If today’s Shiller P/E is 22.2, and your long-term plan calls for a 10% nominal (or with today’s inflation about 7-8% real) return on the stock market, you are basically rooting for the absolute best case in history to play out again, and rooting for something drastically above the average case from these valuations. This could happen. For instance, it could happen if total real earnings growth surprises to the upside by a lot for a very long time. But unless you are comfortable with forecasting that, or some other giant positive surprise, we believe one should give credence to the lower forecasted average returns from history. While market timing might not be the answer, changing your plans — assuming a lower expected market return, perhaps saving more or spending less, or making changes in your portfolio structure — are all worth serious consideration. I think the Shiller P/E is quite meaningful for planning. Some outright hucksters still use the trick of comparing current P/E’s based on “forecast” “operating” earnings with historical average P/E’s based on total trailing earnings. In addition, some critics say you can’t compare today to the past because accounting standards have changed, and the long-term past contains things like World Wars and Depressions. While I don’t buy it, this argument applies equally to the one-year P/E which many are still somehow willing to use. Also it’s ironic that the chief argument of the critics, their big gun that I address exhaustively above [from the earlier post], is that the last 10 years are just too disastrous to be meaningful (recall they are actually mildly above average). While it’s indeed important to remember that no valuation measure is near perfect (I stress that in my initial table), I do believe that the Shiller P/E is a reasonable method, an unbiased method (it’s been 15+ years since it was created so nobody cherry picked it to fit the current period), and a method that is decidedly not “broken” based on today’s inputs. It has very limited use for market timing (certainly on its own) and there is still great variability around its predictions over even decades. But, if you don’t lower your expectations when Shiller P/E’s are high without a good reason — and in my view the critics have not provided a good reason this time around — I think you are making a mistake. The current Shiller PE of 23.4 implies a real return of less than 0.9 percent per year for the next decade, with a best-case scenario less than 8.3 percent annually, and a worst-case scenario of less than -4.4 percent annually. Read An Old Friend: The Stock Market’s Shiller P/E (.pdf). On The Great Shiller PE Controversy: Are Cyclically-Adjusted Earnings Below The Long-Term Trend? AQR’s Cliff Asness released in November last year a great piece called, “An Old Friend: The Stock Market’s Shiller P/E (.pdf)” dealing with some of the “current controversy” around the Shiller PE, most notably that the real earnings used in the Shiller PE are lower than they would otherwise be because of two serious earnings recessions: the tail end of the 2000-2002 recession, and the monster 2008 financial crisis. They point out that we had two serious earnings recessions recently (though only the tail end of the 2000-2002 event makes it into today’s Shiller P/E), including one that was a doozy following the 2008 financial crisis. So we have to ask ourselves, is the argument against using the Shiller P/E today right? Are the past 10 years of real earnings too low to be meaningful going forward (meaning the current Shiller P/E is biased too high)? 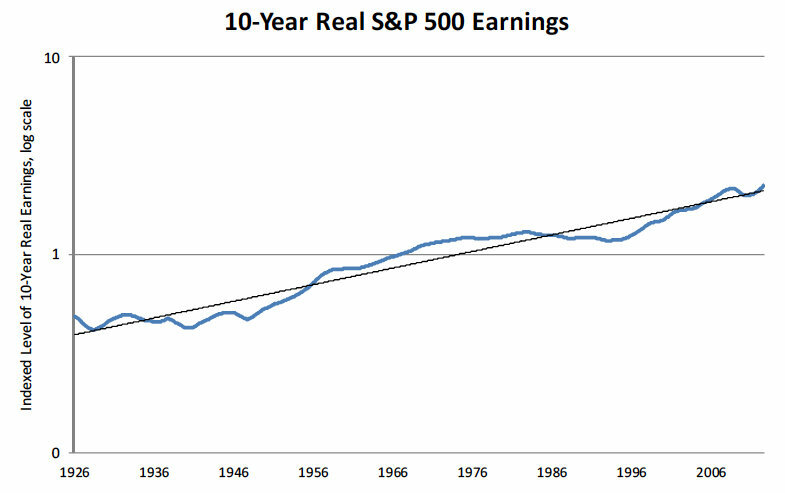 It has not, in fact, been a bad prior decade for real earnings! The core argument of today’s Shiller P/E critics is just wrong. While the graph speaks for itself, there is some logic to go with the picture. Critics of the Shiller P/E point to the earnings destruction right after 2008 and ask how we can average in that period and think we have a meaningful number? After all, aren’t we averaging in a once-in-a-hundred-year event? But they usually do not object at all to the very high earnings, for several years, right before the bubble popped in 2008. One view of earnings is that the 2008 event stands alone. It didn’t have to happen, and doesn’t have relevance to the future and should be excluded from our calculations lest it bias us to be sour pusses. That is not my view (granted I’m a bit biased to sour puss in general). Another very different view is that the earnings destruction post 2008 was making up for some earnings that, for several years prior, were “too high”, essentially borrowed from the future. In this case, the post 2008 destruction is valid for inclusion as it’s simply correcting a past wrong. Rather than invalidate the Shiller method, the 2008 earnings destruction following the prior earnings boom is precisely why the CAPE was created! Not surprisingly I fall into this latter camp. I think the above graph is a TKO. Those who say the Shiller P/E is currently “broken” have been knocked out. So, according to Cliff Asness, despite the recessions in 2000-2002 and 2008, the real ten-year average of earnings used in the Shiller PE is slightly above its long-term trend. Note that the current Shiller PE multiple of 23.5 is also about 42 percent above its long-term average of 16.5. Together, these two observations make the market look very expensive indeed.